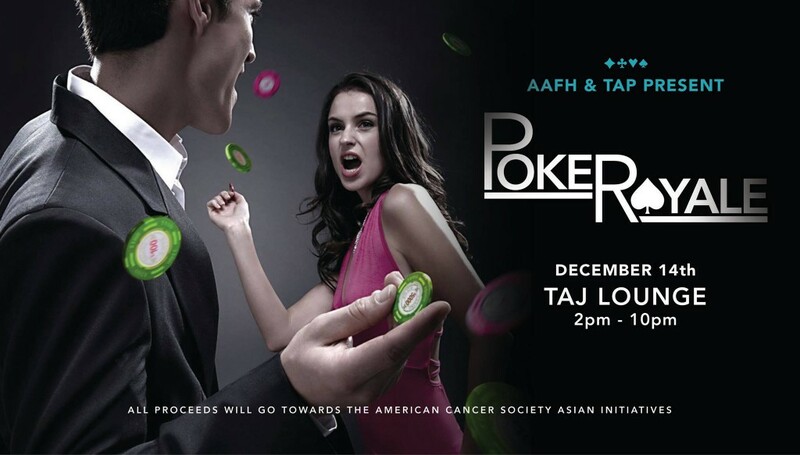 Ladies and Gentlemen, on behalf of Asian Americans for Hope (AAFH) and Taiwanese American Professionals (TAP), we cordially invite you to “POKER ROYALE,” a charity poker tournament benefitting the American Cancer Society (ACS). There are many prizes to win, including a Playstation 4 and the right to win Google Glass! In true James Bond fashion, December 14th, 2013 will be a night of action, elegance, and excitement. This is a fun way to put a “bad beat” on cancer, as proceeds from the event will contribute towards programs, services, and education on cancer prevention in the Asian American community. No user commented in " POKER ROYALE "